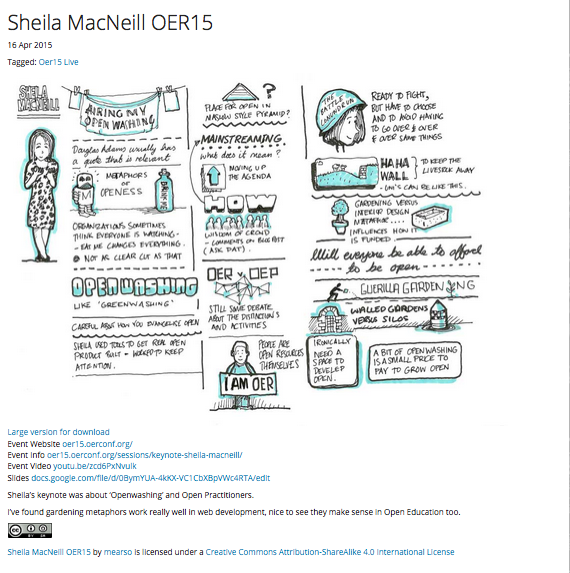 This is just a short post with links the slides from my keynote yesterday at #oer15. I’m still processing all the open goodness that was evident throughout the conference. But a bit thanks to all involved, particularly The co-chairs Martin Weller and Haydn Blackey. The mantle has now been passed to Lorna Campbell and Melissa Highton for #oer16 in Edinburgh. It’s already sounding like the must do conference of next year. Below is the script ( in a very loose sence) of what I planned to say, I think I almost did it but you can watch the video (starts a couple of minutes in) and download the slides from the conference website. Or you can just look at this fabulous visual summary by Kevin Mears. Firstly I want to thank the conference co-chairs, Haydn and Martin, for taking a bit of a risk and asking me to present today. This is my first OER conference I am delighted to be with you all in Cardiff. As you know the theme of this year’s conference is mainstreaming open education. As someone who works in the mainstream, I’m going to share with you my thoughts on mainstreaming open education, the opportunities, balance and pragmatic approaches I take to open-ness in education As a self declared open practitioner I want to take the opportunity to openly share some of my open washing with you today. When Martin asked me if I would keynote at the conference, I was a bit taken aback. It was not long after last years ALT- C conference where the keynote speakers, in particular Audrey Waters and Catherine Cronin, raised the bar quite considerably. After briefly questioning Martin’s sanity, we both agreed that a really strong message coming from both Audrey and Catherine was the need to create and maintain our own narratives about education and for all our voices to be heard. Taking heart and inspiration from them both, I think my voice; my narrative is one that is as worthy as anyone’s of being heard. It is unashamedly from a Scottish/UK HE perspective. It’s based within a learning and teaching not research context. That’s where I work, that’s my mainstream. It’s not from one of the big, the ancient, the always ahead of the curve places. It’s from about as middle of the mainstream as you can get. I hope it represents and raises the mainstream narrative. After agreeing to “take the gig”, two things simultaneously sprang to mind: the phrase don’t panic and of course the late, great Douglas Adams. I find that there always seems to be an appropriate quote from Douglas for any social situation. The works of Douglas Adams are also a great place to find inspiration for titles for talks. I thought I had a perfect, if perhaps clichéd, title of “the hitchhikers guide to OER”. I could weave a tale or two around some of my adventures in the crazy world of open education. There were so many analogies between the characters, it would be funny, it would be heartwarming, what could possibly go wrong? As I continued with this train of thought, my certainty began to waver. Particularly as I began to think more about the cast of characters I could weave into the presentation. Would I be a female Arthur Dent armed only with my dressing gown, CC licensed towel wandering in bewilderment around the OER galaxy? Who would be my Ford Prefect? My Trillian, my Zaphod? It also began to occur to me that in fact I was probably more likely to be cast as Marvin, the paranoid android, . Not because I have the brain a size of a planet, I am the first to admit that I most certainly do not. Rather, everything I was thinking about seemed to end with me saying in dulcet monotone “yeah, but back in the real world we can’t do that”. However I was still quite taken with the idea, particularly with the Vogons. They could be the venture capitalists destroying our lovely OER world just at the point where it was about to get interesting. Or actually doesn’t their fondness for bureaucracy makes them more akin to certain members of university administrative centres and procedures? I mean just how many committees do you really need to go to get an OER policy approved? At this point I realized I should probably stop as I could be in danger of getting sued. And so another classic tale came to mind, that of Alice in Wonderland. Not because of the equally madcap cast of characters or the rabbit hole. Both have similarities with mainstream and open education. I was mainly drawn to “ eat me, drink me moment”. This really made me think of a key moment of realization within my own experience of open education. When you take a bite of the open cake (and I know I am straying from the original here, but I think if Lewis Carroll had been writing today he would definitely have featured cupcakes) it can lift you into a new world, where you start to make connections with all sorts of people and organizations. It can be an amazing experience to connect with new people in new open ways. You become part of the swirly, twirly mass of goodness and open-ness. I know, only too well, that feeling of egotistical joy when you spot yourself in that mass. Conversely, the opposite can be true. A drop or two of the open juice can make you feel very small, insignificant and isolated. How can you possibly make your voice be heard, make any connections within the vortex? I know I have experienced this particularly when participating in open courses. This the scary part of open, and the part that can be really challenging for mainstream. People, quite often senior management, have a tendency to see things only from the eat me point of view. They think anything open will automagically be viewed, talked about, exploited by “everyone”. The reality is, as we all know, somewhat different. As with everything there is a balance to be struck. This is equally as true for institutions as individuals. Deciding how open you want, or indeed can be, takes time. It is a constantly shifting balancing act. Creating balance requires flexibility. In my life, I take a fairly flexible approach to open-ness. For example I built my slides for this presentation using Haiku Deck, mainly because it provides integrates a Creative Commons image search capability. I know the images I am using are openly licensed. I have added some of my own photos and drawings, which are also openly available and licensed on Flickr. Other tools/things I, and I suspect many of us use maybe called open but are they really? I’ve used list.ly as an informal reference list tool for this talk which I’ve shared. And so the open washing begins. As I blogged about last week, there are also comparisons to be made with their seven sins. However, I am wary of using that type of emotive, religious language. Particularly when we are talking about mainstreaming. There is a fine line between being an evangelist, and a person who everyone tries to avoid in case they try to convert you/bore/scare you to death. Looking at the greenwashing sins in an educational context, I agree that many of them need to go straight into the sin bin. One thing I think we are all really glad of is, the growing amount of evidence we have around many aspects of open education, open publishing and access. This conference and, all you presenting here, is making another significant contribution to that growing body of research. We do of course, still need more, but we are starting to get “proper” evidence to take to senior managers to show the impact, value and cost benefit of open-ness. However, I’m keeping the lesser of two evils, worshipping false labels and hidden trade offs out of the bin just now. In mainstream education we have to deal with these all the time. I know I have, and continue to, make many trade offs, through choosing the lesser of two evils, to get the trade off of getting some kind of open into a project and/or people’s minds. As some of you may have seen at my lightning presentation yesterday, my team at GCU developed and ran an open event online event last year in that ran in conjunction with the Commonwealth Games. It was open in many different senses of the word. We did do some “proper” reuse of some open content, but we did use a so called open platform, which is only open to use by existing customers of their “paid for” platform . . . I could go on. But, the big trade offs for us were that in a very short space of time we were able to firstly get something online, using things we were familiar with, that didn’t involve any above the line costs. Secondly, and perhaps more strategically important, it allowed us to get and keep the interest of our PVC Learning and Teaching. That bit of open washing moved open-ness quite significantly within our context. And that was my main aim. I don’t need to ask forgiveness for any sin because in my context the means were more that justified by the end. Context is critical in any situation. I remember Stephen Heppell at a conference many years ago saying, “if content is king, then context is majesty”. So, where does open fit in our context just now? If we look at Maslow’s hierarchy of needs where does open education/content/access sit? How does it vary between our personal needs and our institutional strategic aims and values? At the top of the pyramid there are obvious links to personal and institutional needs/visions around esteem and self worth. Open fits nicely into those. You could probably argue a case for each one, but the links aren’t always obvious to our senior managers. There are lots of competing priorities within mainstream education. Whilst we may laugh at the fact that Wi-Fi is now a defacto new, underpinning layer into the pyramid, I feel it is a timely to ask ourselves how, why and if, open, in its broadest sense fits or if it should be subsumed into all of the layers, embedded throughout rather than being a distinctive, separate need. To help us answer this, we need to look to what current drivers for mainstream education actually are. It’s also timely to remind ourselves of what mainstreaming actually means. In this instance I think that the Wikipedia definition is pretty good “generally the current thought of the majority”. In the UK there is no better place to get the thought of the majority than from ALT. If we look at the most recent ALT member survey we get a really clear picture of UK HE/FE mainstream priorities for learning technology. Looking at the results for the current and increasingly important drivers in terms of learning technology we can clearly see the complexity and the range of other “things” open-ness is competing with. Whilst it is encouraging to see that open education practice, resources and policies are on the rise, they still have a way to go to be top of the list and indeed even be mentioned in the same breath as some key drivers such as assessment. In my own institution, we have just surveyed our staff and have used some of the ALT categories for sectoral benchmarking. Whilst I haven’t had time to analyze the findings yet, at first glance in terms of open-ness they pretty similar to ALTs but open is a bit lower down. However, going back to the hidden trade off, we can leverage open-ness within key priorities, particularly in my case with online developments. And on the plus side I know anecdotally that people are talking more about OER more than when I started about a year and a half ago. When I asked people do you use/create/ OERs I was met a lot blank faces, and shaking heads. In an attempt to explore mainstream practice a bit further, and find out how people actually mainstream open, back in February I wrote a little blog post and asked for some feedback and examples of how people are mainstreaming open education. I was overwhelmed by the response, and many of you that did respond are in the room today, once again thank you all. I do have to give a special mention to Pat Lockley for almost single handedly responding and extending the debate. Whilst I urge you all to go and have a look at the responses, I’ll try and share what I took away from the discussions. To help me cut through some of the complexity of the discussion I thought some visualisations might help. A simple word cloud of the comments makes for quite a pretty picture, but doesn’t really tell us anything. I tried to be a bit clever and do a bit of text analysis. Again a nice picture but it doesn’t really do justice to the depth and complexity of the discussions. What struck me most was the difference and tension in views between how and why of OER and OEP. The comments drifted from the “how” of mainstreaming more to the “why” and back again. On the one hand there was strong advocacy for clarity and rigor around licenses and content, and on the other a desire to experiment and extend practice more. For mainstreaming I think we need the more of the latter. Education is more than resources; I again refer to context as majesty. I want our students to be open practitioners, to be able to express themselves and interact appropriately and openly, not just be consumers of open resources. I was delighted then, with Tony Hirst’s contribution to the discussion. Tony pointed out that we are all OERs. We are the most important resource our institutions, our society have. If we want to move further up the mainstream then perhaps that is something we all need to work on. I know over the past couple of years I have begun to self identify as an open practitioner; we need to enable more of our colleagues to do so. And so it comes to the point where I have to address whole battle for open, and some of my reservations about it in terms of mainstream education. Martin and I have a good-natured difference of opinion about the battle metaphor. One of my issues with it is that a lot of people in the mainstream don’t actually realise that there has been a battle, let alone who has won. As Martin added to the title of his book, winning a battle sometimes doesn’t feel like victory. If we look to recent UK politics, losing a battle for the SNP certainly didn’t end the “war” the way the UK establishment presumed it would. But I digress. My main problem with battle and war analogies in the mainstream is far simpler. Working in the mainstream can be very rewarding but it can be really hard and you do have to go over, and over a lot of “stuff’. I don’t want to have to engage in yet another war, take part in another battle everyday. I don’t have the energy for that. Those of us in mainstream education have enough “challenges” to deal with already. That’s not to say I’m not ready to fight for what is right. I just have to choose my battles very carefully. Mainstreaming is about pragmatism; it’s about patience; it’s about the long haul. We take our small victories as and when we can. Going back to the mainstream priorities we looked at, we have lots of priorities to deal with. So instead of battling about the battle, I want to talk about some at the other end of the spectrum. I call this my HAHA moment. I want to take to you to the world of landscape gardening. Gardening, cultivation is a much more apt analogy than battles and wars for education in general not just open education. Education is fundamentally about nurturing, sharing, growing. For those of you not familiar with a HAHA , it is a device used by landscape gardeners to help create and maintain views/vistas of usually very large gardens. Pioneers such as Capability Brown used them to create pastoral scenes for large country houses. The Lords and Ladies of the house could enjoy seeing their live stock in the distance, but the ditch prevented said sheep/cattle from getting too close to any more tended, precious areas of the garden. In many ways our universities are similar to large country estates; they sit within extensive physical and increasingly digital spaces. Our senior managers tend to sit in large offices where they can peruse their estates. There is perhaps a metaphorical haha between “them and us”. Like country estates, economics have an affect on how our universities are run and how their estate is tended. There is a cost to open-ness , which has huge implications for mainstreaming. Some institutions have a lot of money to spend in adding formal, open spaces, in tending their flock and developing open as part of their mainstream priorities. They tend to have the capacity to subsume and develop open research initiatives. Some may be selling the proverbial family silver to keep up. Others, mine included, don’t have that luxury and are looking at a strategic level to invest, maintain and grow different parts of their garden and the staff who maintain it. I have benefited from being a very luxurious position during my time working for Cetis, where my open practice was supported. That allowed me to evolve into the practitioner I am today. Not many mainstream educators have that luxury today. Speak to any typical lecturer and they will reel off the reality of trying to combine teaching, research and admin priorities. In the UK since the Jisc/HEA funding there has been a dearth of specifically open funding programmes. There could be a danger of a small number of open silos developing, money following the money if you like, a new “open club” of those and such of those. That is not mainstreaming. However, it’s not all doom and gloom. There are still opportunities for open-ness to take root and flourish. I give you the guerrilla garden. In the same way that people are taking over abandoned patches of ground for gardening, we can take our patches of activity and do some guerrilla open educational development. It appears, and takes root before anyone actually realises what’s happened. I have described our Games On development as a guerrilla development. A lot of bottom up open development happens in this way, my colleague Marion Kelt has taken a similar approach to developing our OER guidelines. Which will hopefully be actual policy soon. Going back to “I am OER”, we need to find more ways for staff and students to have, perhaps initially, pots or window boxes of open-ness that they feel comfortable with tending and maintaining. Hopefully they will then “get the open bug” and move into and take over/ create more formal and informal learning spaces. Walled gardens are not a new concept to education and are an important part of our mainstream estate. This brings me to another open paradox. Whilst declaring myself an open practitioner, and supporting open-ness in its widest sense wherever possible, working the mainstream we need to have our walled gardens. The picture in my slides is of a walled garden on the island of Islay on the west coast of Scotland. It is a very windy place so gardening can be tricky. The walled garden there provides shelter and a safe place for a variety of flowers, plants and shrubs to grow. Some will be eventually be put into the open garden; others will always stay inside those walls. Similarly in education, we have a duty of care to our students, and indeed our staff, to provide safe areas where they can develop and grow. Places where we can develop their digital literacies and competencies so that they are informed and empowered to make the most appropriate decisions themselves as to where, when, why, what and how they can share and interact openly. I want to finish with this thought, we can be open anywhere. Spaces like the wonderful High Line Garden in New York, which was derelict and forgotten, is now a thriving, open space that encourage and sustains community activity in ways I’m sure New Yorkers never dreamed were possible. The same is true with open-ness in mainstream education. We have to be wary of being to hung up about definitions; we have to learn to live with a bit of open washing. Open-ness can allow us to be agile; to share, to inspire, to connect, to meet our wider goals of civic responsibility, but it has to be flexible. There is no one size fits all but we have to allow people to be open anywhere they choose, that way we can flood the mainstream with open-ness and extend this community even further. Thanks for sharing this, and thanks for a great keynote!